Which States Do The Best Job Of Branding? How Effective Is Your State At Branding? 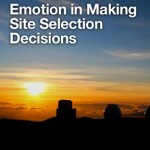 In my last post, I talked about the 2012 Bloom Consulting Country Brand Ranking Report. This post, we turn our attention to the competition between states. 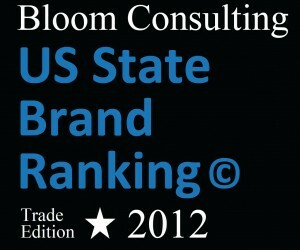 Bloom Consulting has recently introduced its inaugural US State Brand Ranking Report. This Report ranks states on the basis of branding performance. The ranking reflects the impact of state level branding by looking at which state was able to attract more investments dues to its branding efforts. Bloom Consulting can be contacted for deep dive reports that compare one state versus others so you can better understand the differences in branding strategies and what seems to be working. This Report coincides with the opening of a US Bloom Consulting Office. Topping the list of states doing an excellent job in branding is Texas. In addition to its #1 ranking, Texas also earned an SBS AAA rating indicating “the brand strategy is extremely accurate when focused on investor demand, and has a very strong positive impact on its economy.” Florida is viewed by Bloom as a pleasant surprise raked #2 with an SBS A rating. They characterize Florida as a “break-out” player. Bloom calls out several states as “not maximizing their brand potential” despite being ranked competitively. I don’t want to ruin the surprise by telling you which states they labeled as such, so you will need to read the Report to find out. You can download the 2012 US State Brand Ranking Report by clicking on the image below. 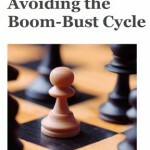 The methodology behind Bloom’s rankings is covered in the Report. In my mind, they take a reasonable approach. Although, it should be noted that like any of the ranking reports the recent economic meltdown definitely influences the assessment. I would be cautious about over interpreting the data and suggest instead that leaders should look over their shoulder because their top 10 ranking is anything but assured going forward. Many states have already made adjustments in their branding efforts that will make them even more competitive for capital investment. If you live in a state with a lower ranking, I would take it to heart and start an exploration of what it will take to close the gap. It is interesting to note that Bloom places high regard on website effectiveness and social media performance. In social media their methodology evaluates data from both Facebook and Twitter. Given the low level of C-Suite executive participation in these two social media channels, I believe not having LinkedIn in the mix is a miss and would argue caution when interpreting any results in this section. But, kudos to Bloom for getting the ball rolling and being a pioneer in attempting to use social media participation as a way to evaluate a state’s branding efforts. What’s The Latest On Social Media? If A Tree falls Does It Make A Noise? As with any new Report, you want to spend time understanding the methodology used to determine the results. There are several surprises in both the ranking and the SBS ratings. 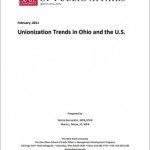 You are going to want to read this Report before your Board members do. It will undoubtedly raise questions about your state branding efforts and it would be good to be prepared in advance with answers. In fact, it may be a good reason to contact Bloom Consulting and ask for a detailed report for your state. The real power of this ranking will be over time. Evaluating longitudinal performance, particularly in light of any specific improvements you’ve implemented, will be very informative. I also suspect Bloom Management’s understanding of the data and their methodology will only further improve with multiple years of information to analyze. Be realistic is your interpretation of the data. For example, don’t underestimate the collapse of the US Automotive industry on the ranking of Midwest states. This was a macro economic event and has little to do with branding. You need to look at the ranking along with the SBS rating to get a truer picture of a state’s competitiveness. And, please be strategic in any changes you make to your branding efforts based on these data. Remember what I always say – Research is simply an aid to judgment, not a replacement for it.